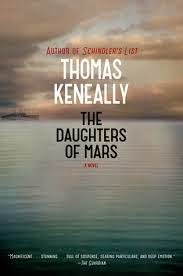 a book chick: "The Daughters of Mars"
my take: I learned about this from a friend (former soccer moms together) who reads this blog ... I bought on her recommendation and was surprised that I'd be wading through World War I for the second time this summer ... and my fourth (fifth?!) read between the two World Wars. The language at first seemed stilted ... a very different style than what I am used to ... and then I got over it and after the half way point was captivated by the story. I did not see the ending coming and when I see the friend who recommended this to me, I may throttle her ... just because, well, you'll see. I'm ready for a break from WAR and as ever amazed by the depth of the literary treasure trove those wars provided. my source: Cindy! Watch out!